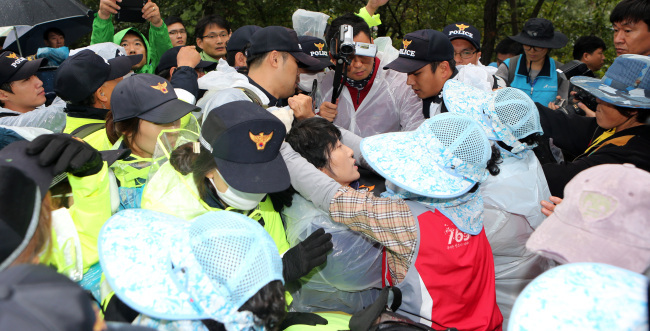 Construction workers and police clashed with local residents in Miryang, South Gyeongsang Province, early Wednesday morning as the state-run Korea Electronic Power Corporation pushed ahead with the construction of 52 towers for a high-voltage transmission line in the area. More than 2,000 riot police were stationed at five of the planned sites to control the crowds of protesting residents. KEPCO workers arrived at the sites at 5 a.m. to lay the groundwork and deliver construction materials by helicopter. KEPCO officials’ stance on restarting the project this time was seen as stronger than ever since its outset in August 2008. This marks the first time that residents’ shelters were pulled down in the 11 times the project has been stalled in the past five years. Around 100 workers were hired by the company to tear down two shelters in Danjang-myeon that residents, mostly in their 70s and 80s, have been manning on rotation for the past few years. Miryang City council member Moon Jung-sun of the opposition Democratic Party was stopped from making a suicide attempt in protest. Opponents denounced authorities’ “forced” construction, and demanded the government and KEPCO revoke the plan. “If they keep forging ahead with the construction, more serious casualties will follow. We hope KEPCO stops the construction immediately and holds an open forum on television,” Lee Kye-sam, secretary-general of the residents’ association, told The Korea Herald. Residents have been demanding alternative measures to building the electric towers, claiming health and environmental issues. Their suggestion, laying an underground power line or relocating the towers to detour residential areas, was rejected by KEPCO officials as being too expensive and infeasible. On Monday, KEPCO CEO Cho Hwan-ik announced that the power operator will restart erecting transmission towers to connect Ulsan’s Shin-Kori 3 and 4 nuclear plants with its substation in Changnyeong, South Gyeongsang Province. “We have no time for further delays if we are to meet the peak power demand next summer,” Cho said in a press conference. Cho promised to avoid physical clashes with senior citizens and stressed the importance of settling the 8-year-old conflict immediately. Meanwhile, a panel of 21 members including residents, KEPCO officials and Prime Minister Chung Hong-won, agreed on a compensation package worth 25.5 billion won ($23.7 million). About 40 percent will be given individually to some 1,800 households in 30 villages located in four regions ― Danjang-myeon, Sanoe-myeon, Sangdong-myeon and Bubuk-myeon ― and the rest is to be spent on environment and other development projects in the affected communities. South Korea narrowly avoided blackouts between June and August, after three nuclear reactors went offline to replace cables that had been supplied with forged safety certificates. The country generates about one-third of its electricity output from nuclear power, to replace imported oil and gas.